We’re only two episodes into Game of Thrones’ seventh season, and we’ve already got questions. The various webs of storylines across the Seven Kingdoms are finally coming together this year as new alliances are formed, old ones are tested, and the impending White Walkers are forcing Houses to look at the bigger picture. Last week’s “Stormborn“ left us with a ton of unanswered questions about what’s happened and what’s to come. For instance – SPOILER alert for Episode 2 – how did Euron find Yara and know Ellaria was on board, what is Littlefinger’s game plan, and should we be worried about Grey Worm? 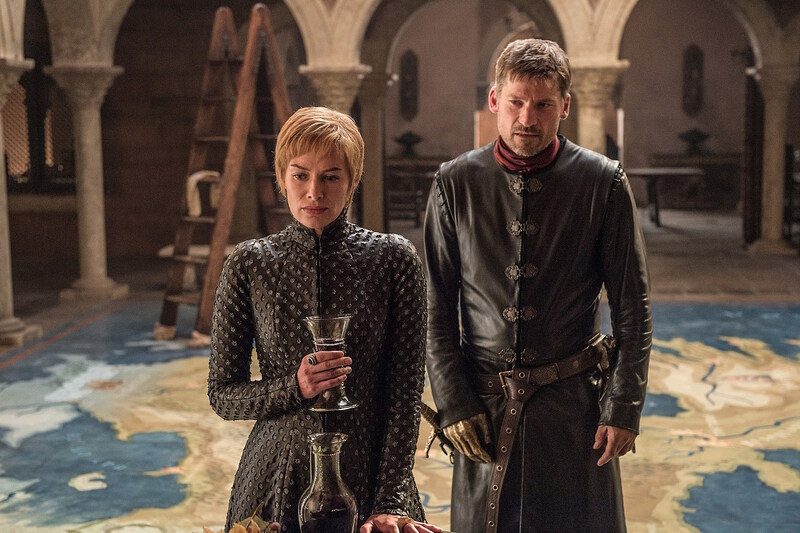 As we head into Sunday’s “The Queen’s Justice,” ScreenCrush’s resident Thrones experts Erin Oliver Whitney and Kevin Fitzpatrick breakdown the top lingering questions they’re hoping to get some clarity on. 1. How did Melisandre learn of Daenerys? How does she reconcile with Jon and Davos? 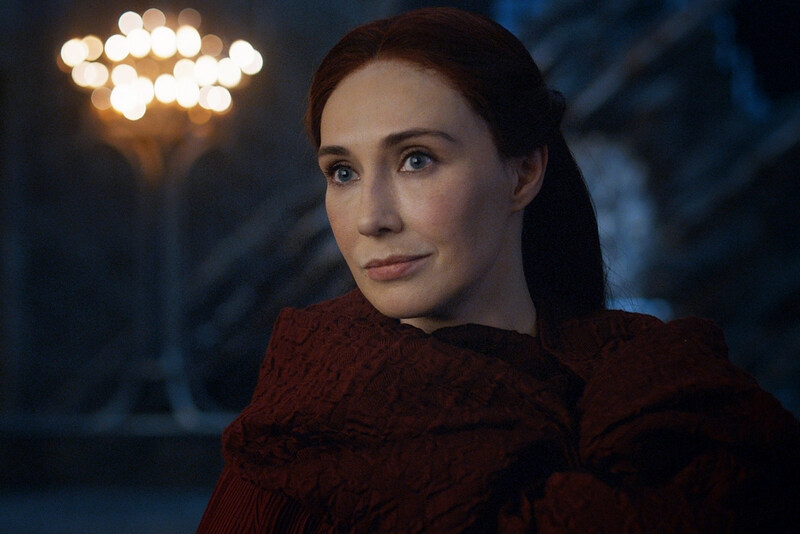 When last we saw Melisandre in Season 6, she’d followed Jon Snow’s command to leave Winterfell, knowing that Davos would likely kill her if he saw her again. 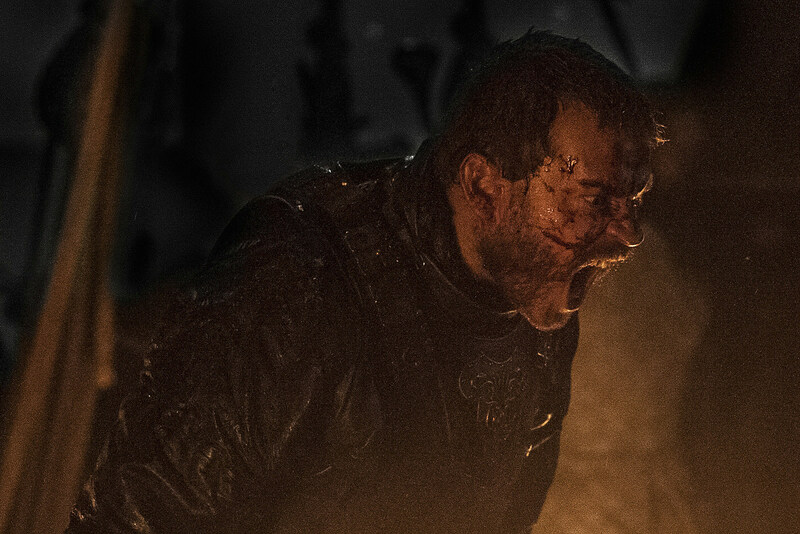 That exile served as a bookend to a season that opened with Melisandre defeated in the wake of Stannis’ death, and searching for a new purpose. Said purpose was naturally renewed with her resurrection of Jon Snow, but what exactly brought Daenerys to her attention, and how did she come to decide that both young monarchs had vital roles in the war to come? Was she in contact with any of the other Red Priests already worshiping Daenerys in Meereen? Does she consider both the prince/princess that was promised, or just Jon? And perhaps most pressingly, will she succeed in staying out of Davos’ way when he and Jon come to Dragonstone? Is Melisandre even staying on as Dany’s advisor, or does that whole “murdering children” thing blacklist (redlist?) her with everyone? 2. How did Euron find Yara, and how did he know the Dornish were onboard? This seemed to be one of the biggest and most obvious questions perplexing fans following “Stormborn.” When Euron promised to return to King’s Landing with a gift, it seemed like he already had that present in mind, but how did he know where Ellaria Sand was? The only people who knew of Tyrion’s plans to attack King’s Landing and Casterly Rock were seated at Dany’s war room table, and it seems unlikely anyone in that room would’ve spilled the beans to Euron. Olenna can be treacherous and untrustworthy, but I can see no immediate gain she'd get from a Euron alliance. My best guess is someone in Yara’s Ironborn fleet snitched – that’s a lot of sailors just hanging around, who's to say they're all loyal to her? There’s also the possibility that Euron simply bumped into Yara’s fleet by chance. If you look at a map of Dragonstone and King’s Landing you’ll notice the two are at either end of Blackwater Bay. Yara’s ships were headed back to Sunspear, the opposite direction of King’s Landing, but considering we saw Euron set sail in Episode 1, he might have gotten a head start and been fairly close to Dragonstone when Yara and her wimpish bro hit the waves. And besides, Euron is a true pirate. Even if he doesn't have sneaky ways of hunting for his prey, he knows the sea. Yara on the other hand was a little, uh, distracted by a hot makeout session. 3. Did Yara survive? Why would Euron let her live? I’m in the admittedly-diminished camp that believes Theon had little recourse but to jump ship and rescue Yara another day, but there’s a larger question here. Euron wanted to murder his niece and nephew the moment he was crowned Salt King, so what reason does he have to actually keep Yara alive? Ellaria and Tyene Sand are presumably the “gift” promised to Cersei (they were largely responsible for killing Myrcella), so it’s worth wondering what perverse purpose Euron has in keeping Yara as a captive. She might have valuable information about Daenerys Targaryen that either he or Cersei could use, but it’s also unlikely Game of Thrones would kill Yara off without offering Theon at least some chance to atone for his deeds. 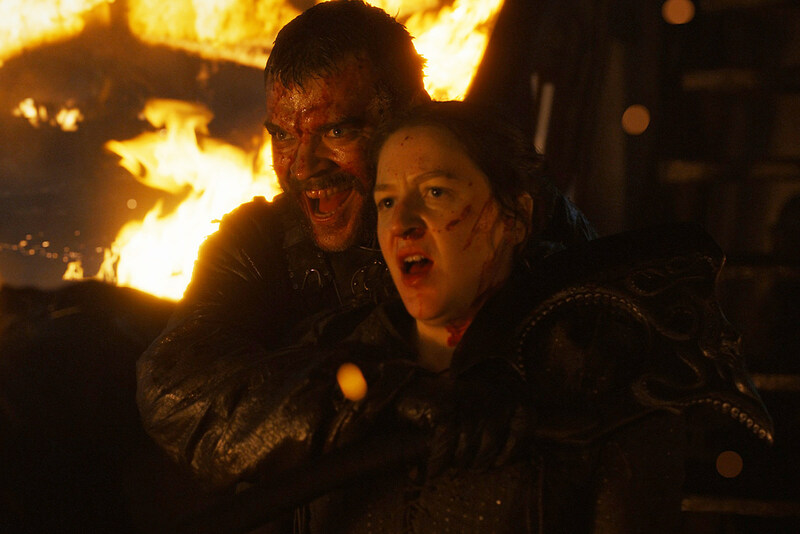 Euron probably won’t make it past Season 7, but he’s bound to take at least one Greyjoy with him, right? 4. What will Cersei do with her “gift”? Speaking of, we’re left wondering what exactly Cersei will do with the “gift(s)” Euron comes bearing. If it were just Ellaria in tow that’d be one thing, but the fact that Tyene, her last-surviving daughter, has been kept alive for a revenge thirsty Lannister is all the more worrisome. I can’t imagine Cersei simply chopping off the women’s heads or giving them an easy death by poison, à la Ellaria’s method; remember, this woman blew up her own damn city with glee. Since Ellaria was the one who killed Cersei’s only daughter, I imagine some nasty vengeance will go down. Perhaps Cersei will come up with an elaborate scheme to force Ellaria to torture her daughter. Or maybe the Queen will enlist the zombified Mountain to do the torturing for her (we saw him do some ambiguously terrifying thing to Unella last season) while Ellaria is forced to watch. Whatever happens, there’s going to be some real twisted mom-vengeance. Make sure you’ve got the Ellaria-screaming.gif on deck. 5. 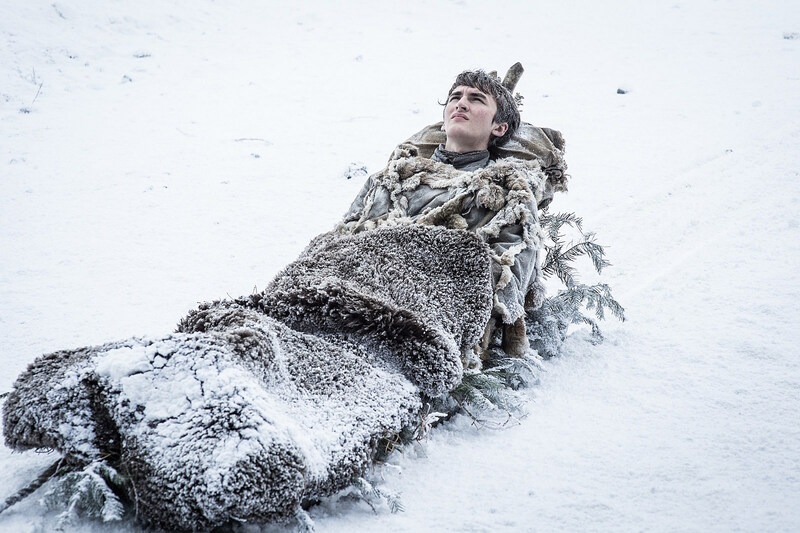 Why hasn’t anyone at the Wall told Winterfell about Bran’s arrival? In just two episodes time, the folks of the Seven Kingdoms have been giving those poor ravens a real workout. Jon’s raven inbox has been blowing up like an iPhone trapped in a group text. But isn’t it a bit odd that no one at the Wall thought to inform Winterfell that a long-lost Stark child suddenly appeared on their doorstep? Oh, and a Stark who has actually seen the Night King and White Walkers, a kid who has serious intel on the war that Jon is currently freaking out over? Now the timeline of events this season isn’t especially clear, and we can’t be certain how much time has gone by since Bran and Meera’s arrival at the Wall. The writers are likely tabling the Wall storyline for a reason as bigger events brew up (like, you know, Jon and Dany meeting), but logically it makes little sense that the Night’s Watch are sitting on a goldmine of information about the incoming army of the dead. Maybe the raven postal service got too busy. 6. What exactly is Littlefinger’s current scheme? Time and time again, Littlefinger’s agenda has always been to serve himself. It’s practically horror movie cliché to see Sansa tolerating his advances and offers of help, knowing full-well he has only one particular interest in hanging around Winterfell. That said, what exactly is his endgame here? Sansa already rejected him once last season, and it wasn’t particularly bright to hang around the Winterfell crypts waiting for the chance to tell Jon Snow how much he wants to bone his sister. 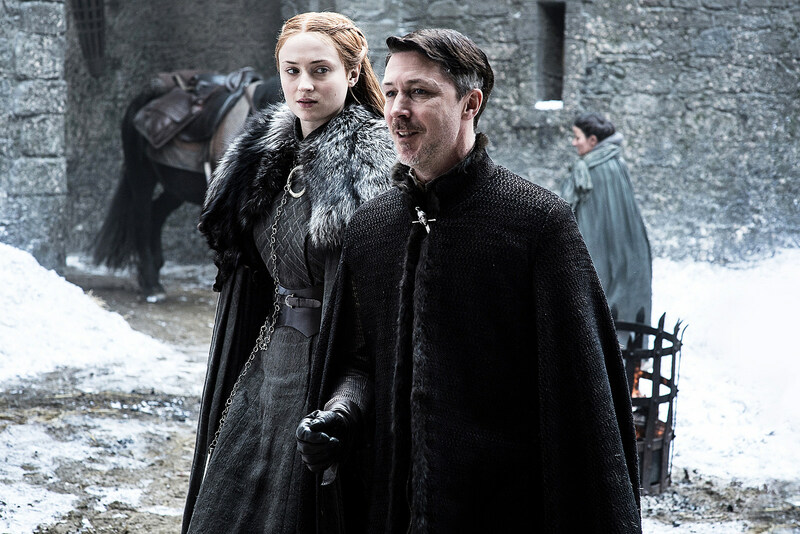 Obviously, Littlefinger’s pleased as punch that Sansa will get a turn ruling Winterfell while Jon visits Daenerys at Dragonstone, but what exactly does he expect to accomplish, beyond further turning Sansa against her brother? Does he hope to be crowned Warden of the North himself, and further his agenda to sit on the Iron Throne? You know, for the five minutes before the White Walkers invade? 7. Does Arya need a new mission for Season 7? Let’s be real: If anyone on Game of Thrones deserves to put down the sword for five minutes and enjoy a family reunion, it’s Arya. That’s precisely why the first mention of Sansa and Jon now lording over Winterfell saw the littlest Lady Stark abandoning her mission to infiltrate King’s Landing and kill Queen Cersei, and heading for Winterfell (with a bonus Nymeria reunion). And of course, it’ll be darling as all get-out to see Sansa and Arya reunited, just as we saw with Sansa and Jon last season. Heck, throw Bran in there too, seeing as no one at Castle Black thought to send a raven that yet another Stark child survived the family downfall for years. The question remains, however: Will Game of Thrones sideline Arya after her return? Despite some well-deserved rest, Arya isn’t the type for military strategy or politics (despite an evening with Ed Sheeran and his Lannister pals, the current King in the North apparently never came up), so Arya will need some new function to fit her assassin training. Might that mean some stealth intrigue around hostile players at Winterfell, or an infiltration mission elsewhere? 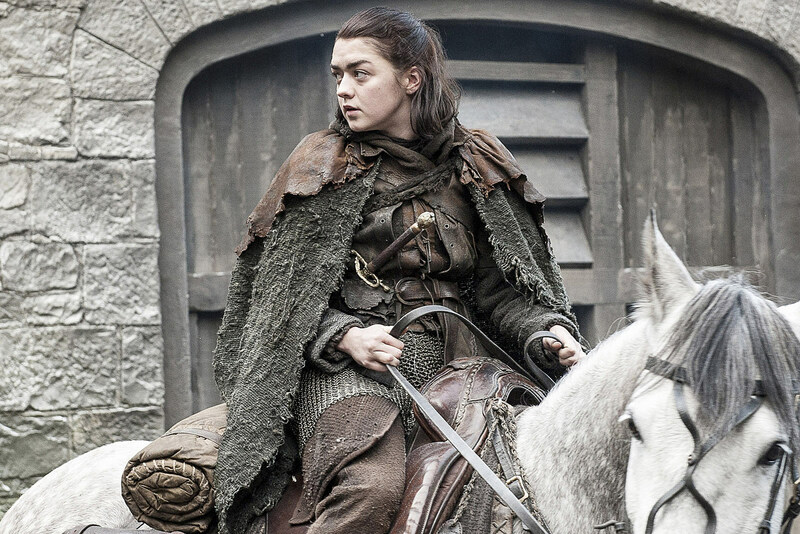 What role has Arya to play in the great war? 8. Why isn’t Qyburn’s dragon plan ... better? Was it just me or was Qyburn’s big reveal for how to take down Daenerys’ dragons incredibly underwhelming? This is the guy who Frankenstein’d the Mountain, who helped Cersei blow up the Sept with wildfire, and here, when tasked with a solution to defeating three enormous dragons, he pulls out a ... crossbow? C’mon dude, this show has ice zombies and magical trees, and the best you’ve got is an old weapon gathering dust in the basement? After all, who’s to say this thing will even work? It looks complicated to maneuver and not exactly quick to reload. Remember, we’re shooting dragons here, creatures with wings. You better have an ace marksmen or else this plan is useless. Hey Game of Thrones writers room, now might be the time to introduce the Dragonbinder. 9. 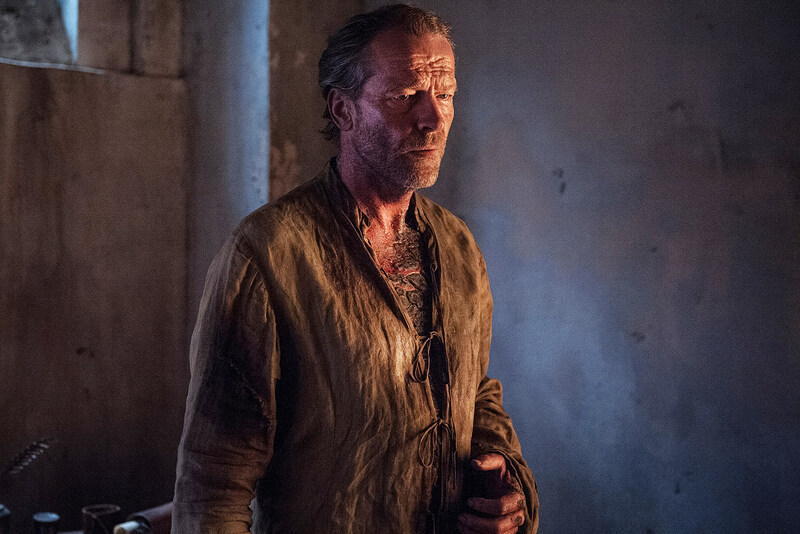 Where does Jorah go from here? 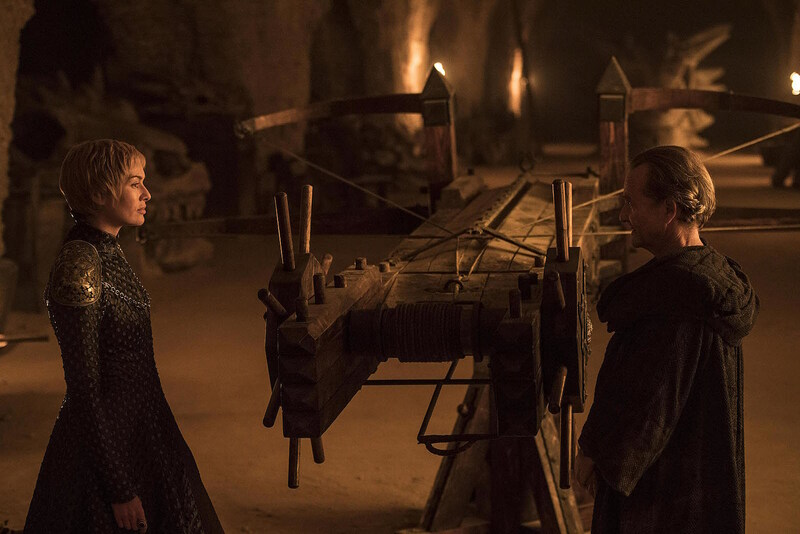 In the interest of storytelling, I’d doubt if “Stormborn” left us hanging on Jorah’s cure for the purpose of revealing next week that “oh yeah, the cure didn’t work, so he’s just dead now.” Perhaps Sam’s olive oil treatment (no, really) stayed the effects of greyscale for only a short while, but – either way – Jorah’s undoubtedly going to make a beeline for Dragonstone in hopes of returning to his beloved Khaleesi. That said, what would Jorah’s ultimate purpose then become? We talk about Game of Thrones sometimes abandoning story arcs that lead nowhere, but it seems terribly wasteful to spend two seasons establishing the significance of Jorah’s greyscale and give him a touching goodbye with Daenerys, only to ... return him to Dany’s entourage for the final seasons, unharmed. Perhaps a noble sacrifice is in order, or some significant mission the Queen might task him with? 10. Is Grey Worm going to die? The Unsullied commander had a big episode last week, finally sharing some physical intimacy with Missandei. The romance between the two has been brewing for seasons, leaving fans anxious to see them finally do it. It was beautiful scene, and a rare one for Game of Thrones that was less about actual horndoggery and more about the vulnerability of exposing and sharing your body, a body that’s been painfully violated by acts of slavery. So now that the two finally had a touching love scene, one’s gotta die, right? This is Game of Thrones, a bittersweet totally gutting show where feel-good moments are followed by gore and anguish. Missandei is likely safe, as she’s often out of danger by Dany’s side, but when the battles begin, Grey Worm will definitely be on the front lines. 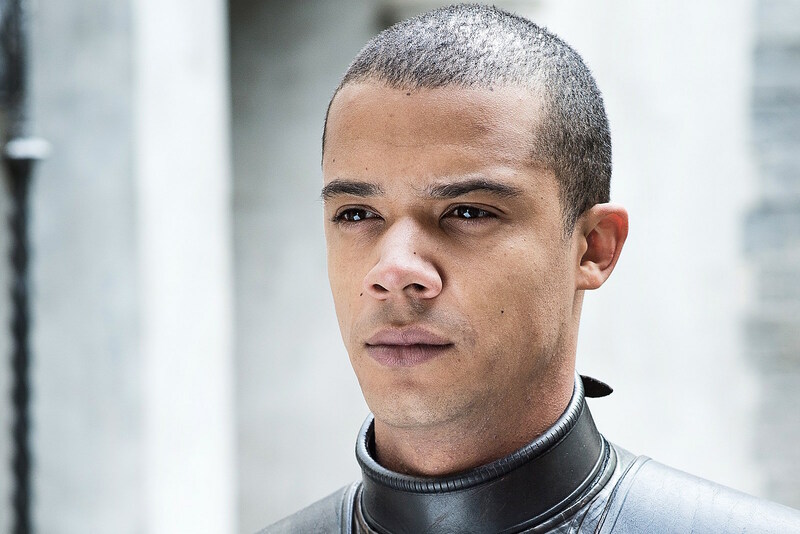 Also, out of the new photos HBO released this week from “The Queen’s Justice,” two were solo shots of Jacob Anderson’s Unsullied soldier, one with armor and one without. Yup, he dead.